For working on his car in the parking lot of the apartment complex he lived in, an innocent black man was harassed and then kidnapped by police. 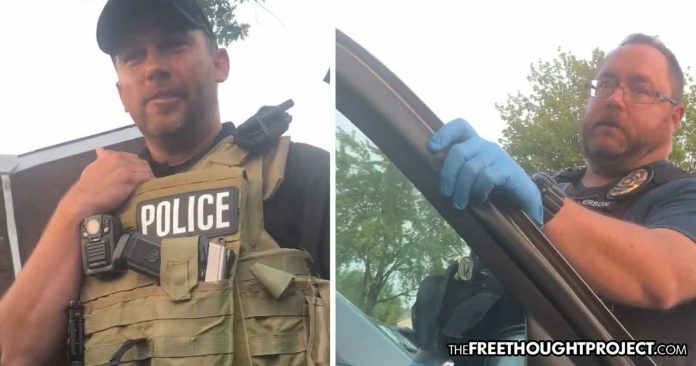 Indianapolis, IN — An infuriating video was shared with the Free Thought Project this week showing an entirely innocent man get assaulted and kidnapped for working on his car in the parking lot of the apartment complex in which he lived. Thanks to a bully cop who made it his job to harass Malcom Evans, the divide between the police and the policed has grown that much bigger. As Evans’ video shows, he was simply working on his car this week when a Southport police officer approached him and began harassing him. The officer was relentless in his pursuit to treat Evans like a criminal yet he’d done absolutely nothing wrong. The officer asked Evans why he was outside, a question that Evans is not obligated to answer. He then asked if Evans lived in the complex and, even though he did not have to answer the officer, Evans told him that he did, in fact, live in the complex. Evans was polite and tried to explain to the officer that he didn’t need to identify himself because the officer had no evidence that Evans had committed, or was about to commit a crime. The officer then claimed that Evans was loitering. Apparently working on your own car, in a parking lot that you pay to park your vehicle in, is loitering, according to the officer. Instead of simply walking away and apologizing for harassing the innocent man, more officers arrived and then told Evans that he was guilty of not showing his identification to police. Although Indiana is a stop and identify state, there was no reasonable suspicion that he had committed an infraction or ordinance violation, giving rise to an obligation to identify himself upon threat of criminal prosecution. Evans knew this too. “In order for there to be a crime, there has to be an injured party,” Evans said. However, the only injured party was the cop’s ego after being put in check by an innocent black man who knew his rights. As the officers kidnapped Evans and threw him up against the vehicle, the original officer is seen on the camera stomping Evans’ phone, clearly illustrating the nature of his intentions. As Evans explained in his Facebook post, this is what “working on your car while black” looks like in a police state. UPDATE: TFTP originally reported that these officers were from the Indianapolis Police Department. This was incorrect. These officers are with the Southport police department. We apologize for the mistake.